Home Cycling Coloma: "I think that Contador wants to come to the mountain bike"
Coloma: "I think that Contador wants to come to the mountain bike"
The bronze medalist in the Rio Games and world gold, spoke with As about the possible incorporation of the pinteño to the MTB. "It would be a pride," Carlos admitted. Carlos Coloma (Logroño, 37 years old) continues to show the illusion of a beginner's bike being a veteran. 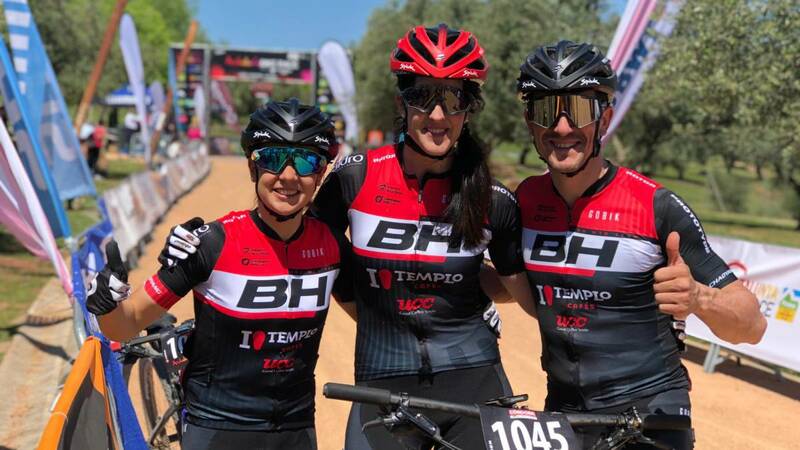 The biker was present as his team's ambassador, the BH Templo Cafés, in the Andalucía Bike Race of 2019 held last week, where David Valero shined in the men's category, conquering the general classification. After starting his preparation for the next few months World Cup tests of Mountain Bike, Carlos chatted with As on the present and future Spanish in this discipline, the objectives of the selection for the Tokyo Games, and even, on the possibility that Alberto Contador participate in MTB tests of the most High level. How do you rate the performance of the Spanish in the last edition of the Andalucía Bike Race? -It is the longest stage test here in Spain, with six, and one of the most prestigious in the world. I found the race very interesting. The category of boys has been very disputed with Tiago, although David Valero had margin in the classification. Has demonstrated a level that is already known by all. Why moment passes the present and future of the Spanish MTB? -The present we are still Sergio Mantecón and me. Of corridors that come from behind I would highlight, without a doubt, Carlos Canal, 17 years old. He is the only runner in Spanish history who has won two consecutive 'Junior Series' races, which is the equivalent of the junior world cup. Jofre Cullell is also doing really well in sub-23. In the female category, Rocío del Alba has been the discovery of modern mountain biking for 21 years. It is the first Spanish of the UCI ranking. He would have a direct place for the Games if he continues at this level. His career is being impeccable. Does Spain have real medal options at the Tokyo Games? -Yes, without a doubt there are medal options. It has been shown that the Olympic Games are a race with a lot of pressure at the media level. To be every 4 years, with the 40 best runners in the world, when entering the game so many things ... The three that we will be on paper, although there are runners at the level of Nino Schurter, who have more regularity than us, in A race the fan is very open. In the selection we are a pineapple, which is something very positive in the face of the final result. Excyclists like 'Purito' Rodríguez and Alberto Losada have joined this discipline in recent years. What does the MTB bring to those who come from the road? -I have a personal relationship with them and I think that for the future, Contador would also like to come to Mountain Bike. With the background they have, the class and its quality, in cross country races, and more at their age, they would not be in head groups. But I think marathon races are super interesting for them. You will discover another facet of this sport, trails and spectacular places where you can only arrive with a mountain bike. They bring an incredible media tug that is very positive. Will we see Alberto Contador soon on a mountain bike? -That will be his decision and I think it will be for later. Yes it is true that maybe later we will have the fortune to have him among us and enjoy his company on the mountain. As a mountain bike ambassador, we will be proud to welcome you. At the moment we have the opportunity to talk to him, we will do our bit to make your adaptation as fast as possible. Now it is very busy, but I would love to be part of that. In the mountain bike has the doors open. Last year you climbed a 30% ramp with large plate. Has it been your greatest craziness on a bike? -Yes. It was an event that we did in 2018 at Tibidabo with Ibon Zugasti and Marc Marquez. Zugasti knew that slope, but he told us that it was impossible to put it on a plate. I told him to go and try it and that's how the challenge came up. By going through that part of the route at the event, Márquez, who also gets stung, said he wanted to go up. I think I was riding a 52-27 development. From below I thought that I would not be able to, but little by little I went up with inertia. The last 80 meters I ended up with a miracle, it was a show. What impeded you to start your journey as youtuber? -Together with the team we created a section for ambassadors of the month, where the winner of the draw takes material of the team, we leave you a replica top range bike. The opening of the channel is to tell, that beyond professional sport, you can motivate people, teach them to use material, do trainings and share our follies around the world. From Tokyo I will see what direction tI want to make everyone very involved in our sport. How do you see the cyclist community on YouTube? -In my case, within this community, I'm lucky to have Valentí San Juan as my partner, one of the most famous youtubers of the moment. We started making collaborations and telling anecdotes. That helps make our sport bigger. Nobody thought 5 years ago that the mountain bike was to have so many followers, practitioners and many brands around him. The popularity of MTB has grown in Spain in recent years, but what is missing to win in repercussion? -As for marathon events like Andalucía and Rioja Bike Race, for my part, I try to bring them closer to the people. Being less hermetic can help us grow a lot. The World Cup tests, thanks to Red Bull is giving us a lot of visibility, although there is still a twist. Yes, it would be necessary for Spanish-speaking people to bring people closer to what the use of material is like, etc. I am convinced that our sport will go more and more. Anyone on TV can watch a football game, but in our case the most media runners have to do our bit to make the mountain bike easier to the amateur. Recently you were in Portugal running in a test with a lot of mud . Were the toughest conditions that you have faced on a bicycle? -They were the harshest conditions, but above all, the most peculiar. In the team we have a level of material practically never seen before in Spain. It was a situation of impotence because carrying new material played a trick on us. The chain did not enter the plate. It was a hill of eucalyptus that had been cut to start the repopulation. They made roads throwing sand in the days leading up to the race, which due to the rains became an impressive mud, which made the links not enter the chain. In 20 years I had not found something like that, it became a real odyssey. I decided that, for the team, I would finish the race even if I was running. What are the next goals of your calendar? -After a few days of vacation we will start this week the preparation for La Rioja Bike Race (from 9 to May 12), as the following week to prepare the World Cup tests in Germany and Czech Republic.